This fourth installment is presented at Viridian Art House and Galeri Utama with more than 400 artists from 31countries. Now till 15th September. 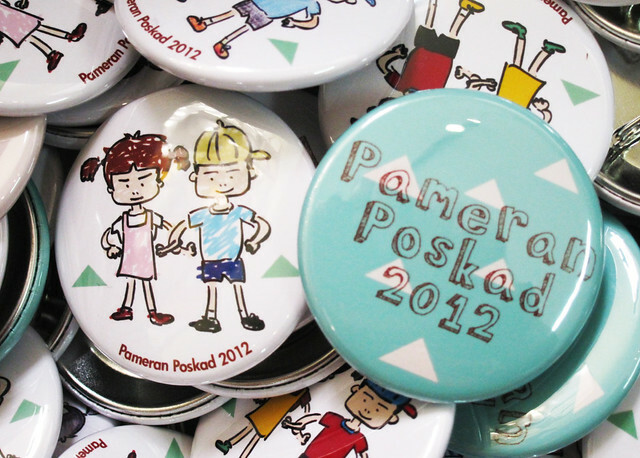 Pameran Poskad 2012 is organised by Tamae Iwasaki, Eitaro Ogawa, Yang Shihui, Izziyana Suhaimi and Sylvia Tsai. 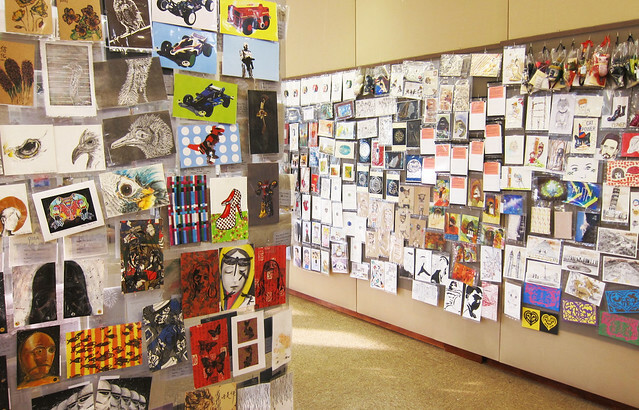 It is a group exhibition of postcard-sized artworks that is open to anyone and everyone who would like to participate. This fourth installment is presented at Viridian Art House and Galeri Utama with more than 400 artists from 31countries. Some internationally recognised artists participating include Jimmy Ong,(Singapore), Donna Ong, (Singapore), Genevieve Chua (Singapore), BenCab (Philippines), Wilson Shieh (Hong Kong), R.E. Hartanto (Indonesia), Jiha Moon (Korea), Takashi Kuribayashi (Japan) and Ahmad Zakii Anwar (Malaysia). This exhibition is about getting people involved in the creative process either through artmaking or through the organisation of the show. 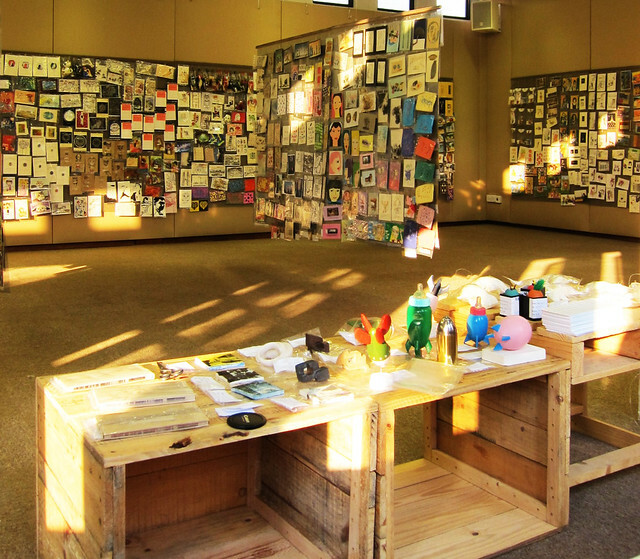 Solely put together by passionate volunteers, Pameran Poskad is a “people’s” collaborative show from beginning to end. The Opening night was a blast! An hour after the Opening, both galleries were so crowded that you can hardly walk through without bumping into someone! I was there an hour before the Opening, hoping to photograph some of the artworks before it gets too crowded. The organisers were still busy setting up things. There was still a lot to be done, but Tamae, Eitaro and their volunteers were calm and organised. Despite having to take care of all the small details that was undone and urgent, they greeted us warmly and were all smiles – the amount of preparation work is no joke, having to handle 400 over applications from 31 different countries! 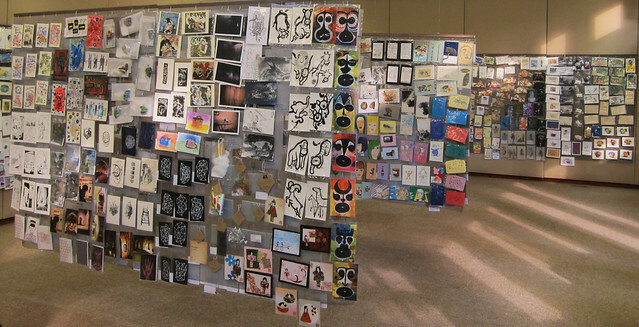 There were about 4000 pieces of artworks to be displayed. The door opens at 6.45pm and the sale of artworks starts at 7pm. 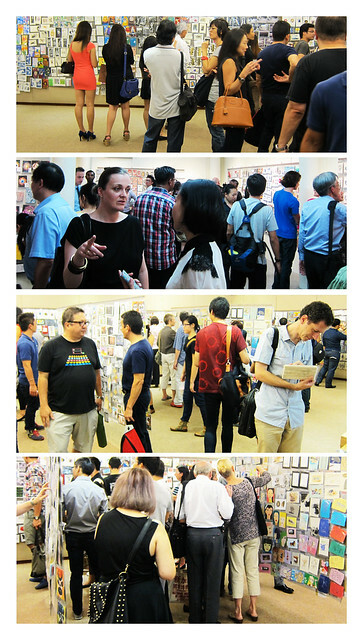 Many works were already sold in the first 30 minutes into the opening! It was a busy night and the organisers were running around handling the sale of the artworks. I decided to not disturb them but to enjoy all the artworks. 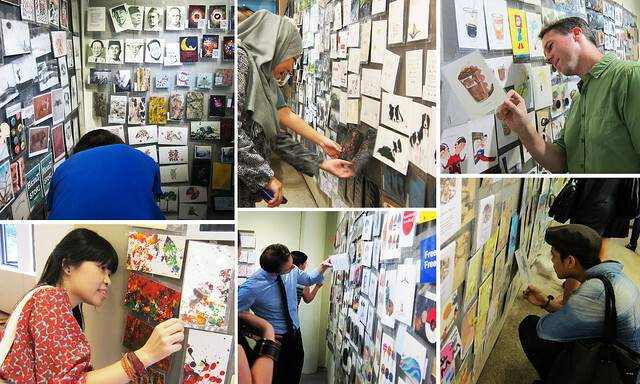 More photographs of the artworks can be viewed here. Chee Wei Teck also took the opportunity to interview 2 participants of Pameran Poskads on their works during the opening. Ms Adeline Kueh (Senior Lecturer of LaSALLE) shared with us about her work “En Passant”, and Ms Erin Caskey (Artist) who got her son, Aedan Pereira involved for this year’s showcase. Ms Adeline Kueh (Senior Lecturer of LaSALLE) shared with us about her work “En Passant”. 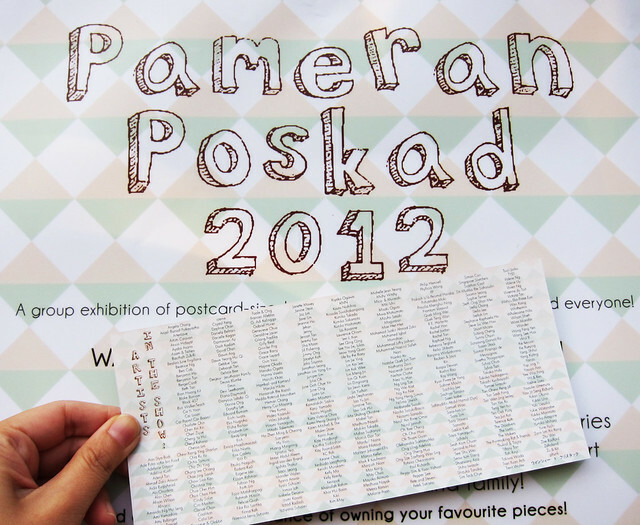 One of the Youngest participant of Pameran Poskad 2012. Aedan shared with us about his favourite work “Alien Chupacabra”.